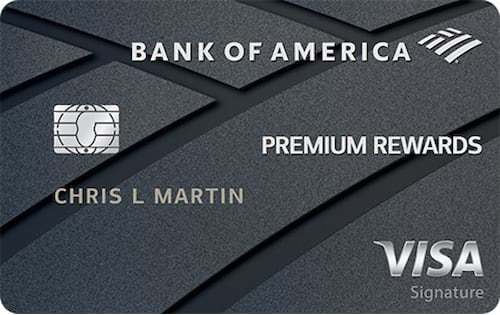 The Verdict: The Bank of America® Premium Rewards® credit card is one of the best rewards cards for people with excellent credit who like to travel and dine out (Bank of America is one of our partners). In fact, it ranked 7th overall in WalletHub’s 2018 Credit Card Rewards Report for the net value that the average person can expect to earn in two years: $1,503. The premium rewards start with an initial bonus of 50,000 points after you spend at least $3,000 within 90 days of opening your account. That’s worth $500. And the perks keep coming, with 2 points per $1 spent on travel and dining, plus 1.5 points per $1 on everything else. The average points card gives you just 1.17 per $1. There’s more to this deal, too, including up to $200 in air travel credits, banking bonuses, flexible redemption and no foreign transaction fee. But this package of perks isn’t free. The Bank of America® Premium Rewards® credit card charges a $95 annual fee. Still, that’s worth paying if you’re a big-spender who plans to make this your everyday credit card. Keep reading below to learn more about whether you should apply for the Bank of America Premium Rewards card. $500 initial bonus: If you’re going to spend $3,000 in 90 days anyway, why not get paid $500 to do it? That’s what the Bank of America Premium Rewards card gives you, in the form of 50,000 bonus points. The average rewards card with points or miles gives you just 19,982. 1.5+ Points per $1 Spent: You will earn at least 1.5 points for every $1 in purchases charged to the card. So already you’re ahead of the game, considering the 1.17 points per $1 you’d get from the average card. And that’s just the Premium Rewards card’s base earning rate. You’ll also get 2 points per $1 spent on travel and dining purchases, which are defined pretty broadly.Dining purchases include: restaurants, fast food, and drinking establishments like bars and taverns. Travel purchases include: airlines, hotels (and other lodging), car rentals, boat rentals, cruises, trains, buses, tourist attractions and even more. 25%+ Preferred Rewards Bonus: Every purchase you make with the Bank of America Premium Rewards card will yield at least 25% more points if you enroll in the Bank of America Preferred Rewards program. It’s free to join, but there are some requirements. Most importantly, you need $20,000 or more in a Bank of America checking or savings account, or a Merrill Lynch investment account. And the more money you have on deposit, the bigger your bonus will be, up to 75%. Up to $100 per Year for Airline Incidentals: The Premium Rewards offers a credit of up to $100 per calendar year for certain air travel purchases. They include fees for checked bags, changing or cancelling a ticket, and airport lounge access. Seat upgrades qualify, too, as do in-flight entertainment, food and beverage. The charge just has to be separate from your plane ticket. $100 Credit for Expedited Airport Screening: If you choose to apply for Global Entry or TSA Pre-Check, Bank of America Premium Rewards will refund your application fee. And you’ll get this perk every four years. $0 Foreign Transaction Fee: This saves you 1.50% on every purchase processed internationally, compared to the average card. That’ll be a help if you travel abroad or buy something from an internationally based merchant while you’re in the U.S. Requires Excellent Credit: Bank of America Premium Rewards offers very generous terms, so it makes sense that you need top-tier credit to get it. But it does mean disappointment for most people. So it’s a good idea to check your latest credit score before you apply. You’ll likely need a score of at least 750 for good approval odds. Very High Regular APR: On average, credit cards that require excellent credit for approval charge interest at a 14.41% annual rate. Even a perfect credit score won’t get you a rate that low from the Premium Rewards card. For additional context, the card's highest APR is above the average among credit cards for fair credit (22.57%) and just below the store-card average (25.74%). Lots of Redemption Options: You can redeem your Bank of America Preferred Rewards points for a statement account, a deposit to a BofA checking or savings account, a deposit to a Merrill Lynch account, travel booked through Bank of America, or gift cards. And points are worth a penny apiece with each method. Minimum Redemption Requirements: You need at least 2,500 points to redeem. And you’ll lose any points that you’ve yet to redeem when you close your account. The Bank of America® Premium Rewards® credit card is one of several stand-out travel rewards cards on the market right now. You can see how it compares to some of the most notable alternatives below. Very good article . Very informative and comprehensive data with sources !